POP displays are enormously important in the wine and spirits industry, particularly since 40% of shoppers who buy alcoholic beverages have not decided what they are going to purchase when they walk into a store. Of the 60% who do have a planned purchase, 21% end up changing their minds once they are in the store. So, having an effective POP display can not only help in brand-building, but it can be the swing factor in capturing incremental sales at the point of sale. Our objective for today’s blog is to show 11 practical and affordable examples of displays that we designed for the wine & spirits industry, but keep in mind that any of these displays can be used to displays food and beverage products or products in a variety of other industries. In addition, any of these displays are easy to customize by changing the dimensions, stain/finishing, and graphics. If you are interested in seeing additional examples, you can check out our blogs Custom POP Displays for the Wine & Spirits Industry, POP Display Concepts for the Wine & Spirits Industry, and 2 Retail Wine Displays You Don’t Want to Miss. Our fist example is a 3-shelf wood floor display constructed of solid pine wood and pine plywood. It’s designed to hold 3 cases of wine. The display features a brown/grey stained finish, PVC shelf and side signs, and a framed PVC header sign. The example shown below is the budget version of the above display. It is the same design, but we eliminated the stained finish, the shelf and side signs, and the frame for the header graphic. We did add a curve to the header sign to create a little more visual interest. Our third example is the 3-shelf Big Leaf Wine display shown below. This display is constructed of solid pine planks which are finished with a dark walnut stain. We added solid wood header and side signs which include one-color screen-printed branding. The overall design provides a more upscale look than our first two examples. 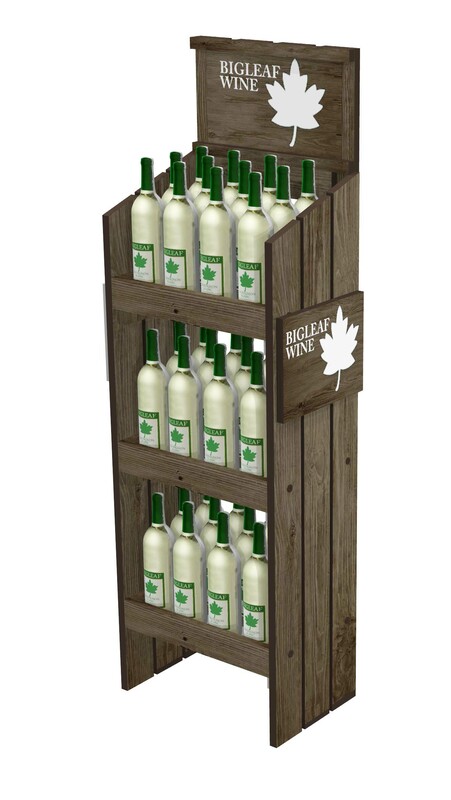 Our fourth example is similar to the above Big Leaf display, but this is a higher capacity display with 4 shelves to hold 48 bottles of wine. It shares the same wood plank construction with the dark walnut stain, but this time we added a framed side and header graphic to dress up the display. Fifth, the Maya Barcelo 3-shelf display shown below features solid wide-plank pine wood construction with a solid wood base, gray washed finish, and PVC side and header signs. Our sixth example switches things up from the shelf displays shown above to a bin-style display for lay-down bottles. This display includes 3 bins for a total of 36 bottles. We designed this display using solid pine wood construction and incorporated a light grey washed finish with black screen-printed side and header graphics. Our next example is a very minimalistic 2-sided metal display featuring knock-down tube construction, 3 sheet metal shelves, a white powder coated finish, and side and header PVC signs. Our eighth example is an upscale 36-bottle wood display constructed of solid pine wood with a rich brown stained finish. It is designed to accommodate 32 lay-down bottles and 4 slanted glorifier bottles. We included a 1-color screen printed logo, but the display has ample space for additional sides graphics. Our next two examples are wood shelf displays to hold 48 and 36bottles, respectively. We used solid pine uprights, pine plywood shelf bottoms, screen-printed wood upper side signs and header sign. The white screen-printed graphics stand out against the dark stained finish. The example below is the same unit in a 3-shelf version. On this version we included PVC side signs to add more visual interest. Our final example is a simple 3-shelf fold-out wire display. This display is very economical but is not built to hold a lot of weight. It would be a good option for 4 packs of smaller bottles, for example. By adding side and header signs, this display is a lot more attractive than a plain wire rack and is still relatively economical relative to other options. 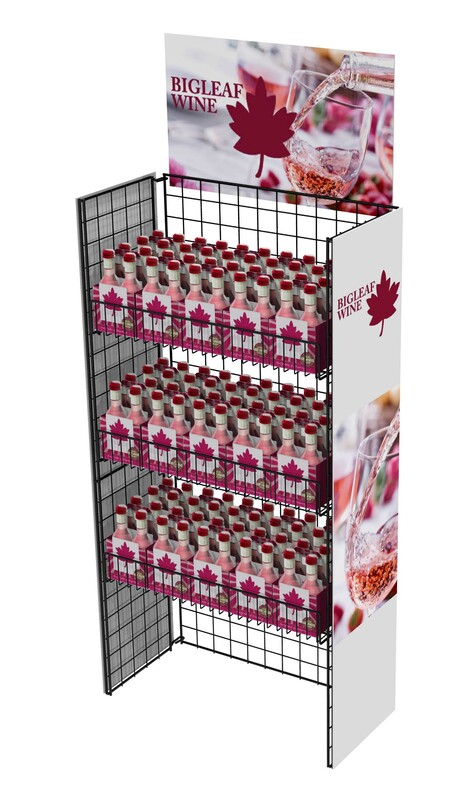 There are many different styles of shelf displays that can be used to merchandise wine & spirits, other beverage products or many other types of products. It is important to pick a style that fits best with your brand and then create graphics that can make the display more effective and impactful.